National Memorial Day in the USA is celebrated on the last Monday in May. All men and women, who gave their lives while serving in the United States Armed Forces, are commemorated on this day. 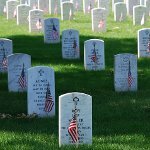 National Memorial Day is formally known as Decoration Day, the day that commemorated the Union and Confederate soldiers, who died during the American Civil War. Later the day extended to honor all American soldiers, who died while in the military service. Traditionally, the flag of the USA is raised briskly to the top of the flagstaff, then it is lowered to the half-staff position. This position is chosen in remembrance of those people, who died for their country. At noon the flag is raised to full-staff as the symbol that the memory of dead soldiers is being raised by the living. Their sacrifice was not in vain, that is why we rise up in their honor and continue fighting for liberty and justice. Thousands of parades are held during National Memorial Day in all large and small cities. Most parades feature marching bands, servicemen, veterans and military vehicles from various wars also participate.